Almost a quarter of people living on our planet, suffer from various forms of insomnia. It's possible that you, or one of your relatives, are among those who are suffering from insomnia. Ignore this ailment, of course, is impossible, but also to rush to take sleeping pills is also impossible! Insomnia (insomnia) is a sleep disorder in which a person can not sleep for a long time, wakes up (sometimes several times a night), or can not fall asleep at all. Insomnia is also called shallow, superficial sleep, which is more like a light nap; Often a dream accompanied by nightmarish visions. In a person suffering from insomnia, the body is deprived of adequate rest, irritability, absent-mindedness appears. The diagnosis of "insomnia" (insomnia) is put in the event that the sleep passes with violations at least 3 times a week for a month. For each person the duration of sleep is individual! The average sleep rate for an adult is 8 hours. Causes of insomnia or "Why can not I sleep?" 2. Physical: pathology of the respiratory system, snoring, breathing disorders in sleep. 3. Circumstantial: constant noise, sharp sounds, bright light. 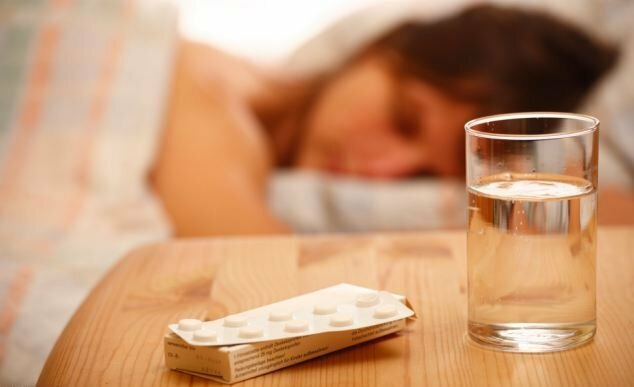 NEVER take sleeping pills (medications for insomnia) without prescribing a doctor! Many of them cause persistent addiction and have a depressing effect on the nervous system! Prevention of insomnia, as well as lifestyle in the treatment of insomnia, usually consists of limiting or completely refusing to eat certain foods, adjusting the regimen and normalizing the emotional and psychological state, through psychotherapy and the use of sedative (sedatives). 2. Do not try to "fall asleep under the TV," "for reading," etc. 9. Before going to sleep, do not think about problems and troubles. If you can not handle it yourself - ask for psychological help. Ingredients: crushed hawthorn flowers 1 spoon, horsetail grass - 1 spoon, birdwort (herb) - 1 spoon, 0.5 liters of boiling water. Grasses mixed well, take 2 tablespoons of the mixture, put in glass, ceramic or enamelware, pour a glass of boiling water and put on a water bath for 15-20 minutes. After this, let cool, drain, bring the volume of infusion to 1 cup with boiled water. Take 0.5 cup 3 times daily before meals. The course of treatment is 1,5-2 weeks. Even amateur (unprofessional) massage of the collar zone, head, neck and ear shells, made before going to bed, is a very good tool, promoting rapid relaxation and falling asleep. Use with caution for drivers of vehicles and for those who suffer from hypotension (low blood pressure)! Ingredients: crushed leaves of mint - 1 spoon, laurel grass - 1 spoon, valerian root - 1 spoon, hop cones 1 spoon or 2-3 cones, 0.5 liters of water. All herbs carefully mix, take 2 tablespoons of the mixture, put in glass, ceramic dishes, pour boiling water, wrap and insist half an hour. Then strain and drink 0.5 cup 3 times daily before meals. The course of treatment is 10 days. With caution apply to those who suffer from hypotension (low blood pressure)! Ingredients: ground herb Leonurus - 1 spoon, valerian root - 1 spoon, fennel - 1 spoon, cumin seeds - 1 spoon, 1.5 cups boiling water. Herbs well mix, take 1.5 tablespoons, put in glass or ceramic dishes, pour boiling water, cover, wrap and insist for about an hour. Then strain and drink half a cup before meals 2 times a day (before dinner and before dinner). The course of treatment is 10 days. Ingredients: 0.5 cups of oregano, mint, laurel leaf grass, hop cones (or 5-6 cones), 4 liters of boiling water. Herbs mixed, brewed in glass or enameled dishes, cover, wrap and let it brew for 1 hour. After this, mix and directly through the cheesecloth to pour into a bath with warm, but not hot water. Take a bath before going to bed for 15 minutes. The course of treatment is 2 weeks. Ingredients: shredded grass and pea flowers - 1 spoon, melissa herb - 1 spoon, 1.5 cups boiling water. Grasses mix, brew (you can in a teapot), wrap and insist 15 minutes. Then mix and drink half the amount of infusion as tea, before going to bed, if desired, diluting it with water (boiling water) and adding honey or sugar to taste.